Nike has given workshops on traditional Nigerian textiles to audiences in the US and Europe during the past 20 years. While she is known for her colorful batik and paintings that offers a modernist gloss on traditional themes, she was brought up amidst the traditional weaving and dying practiced in her native village of Ogidi in Western Nigeria. Her fame as an artist and teacher has taken her all over the globe. Now, she invites you to visit her in Nigeria and immerse yourself in African tradition. Nike found that the traditional methods of weaving and dying that had been her original inspiration were fading in Nigeria. She used her international success to launch a cultural revival, building art centers where young Nigerians master traditional arts and crafts. You can now visit the world of the Yoruba, to explore a culture that has flourished in Western Nigeria for well over 1000 years. Whether you are a specialist in the arts, an enthusiast of African arts or merely interested in a brief immersion in a new culture, Nike offers the opportunity to see Nigeria with fresh eyes. You stay at guest houses at her homes in Lagos, Oshogbo and Ogidi. You travel through Nigeria in air conditioned cars and buses with your guides and teachers. You spend your days visiting museums, galleries, and traditional markets, or studying the techniques used by Yoruba craftsmen and artists. You join her family and her apprentices at mealtimes to sample Nigerian specialties. Textile artists, painters, sculptors, dancers and drummers... 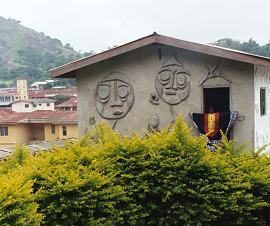 Learn more about Nike's five Art Centers in Lagos, Oshogbo, Ogidi and Abuja, where Nigerian artists and craftsmen ply their trades and where you can study among them. Visiting our art centers and Nigeria, from the moment you arrive until you walk into the departure lounge you are our guest. Learn more about our tours, accommodations, and travel tips for Nigeria. Adire, batik, indigo, beadwork, painting, carving, embroidery, metalwork, weaving and drumming. Our students are engaged in a variety of both traditional and contemporary arts. Visit this page also for information on purchasing our artworks. Shop online. A selection of artworks from our artists. The life and work of Nike Davies-Okundaye have been written about in numerous publications. Read what people have been saying about Nike here. We look forward to hearing from you. Contact us for any additional information on the Nike Art Centers, to schedule a visit, or to invite Nike to your institution for a lecture, demonstration or workshop. Web sites, books and videos about Nigeria and about Nike.